Outsource2india (O2I) helps manufacturers bring ideas to life with its prototyping and rapid prototyping services. Acknowledging that the harsh competition in the market, it's crucial to reach the market sooner that before. Outsource2india enables manufacturers to bring out quality products just at the right time. At O2I, our skilled mechanical engineers create rapid prototypes of various products, ideas, and concepts using high-end technologies Polyjet 3D printing, Stereolithography printing (SLA), Selective Laser Sintering (SLS) and high-speed CNC machining. Our rapid prototyping services offer high-precision models, design iterations, and flexible timelines to aid our clients create a realistic, functionally sound prototype. Our decades-long experience in 3D modeling and drafting allows us to assist clients with choosing the appropriate technology and material to ensure inclusion of essential features in the prototypes. Through Etching, 3D Printing, and other additive layer manufacturing software, our team takes up prototype design and CAD environment simulation assignments of varied complexities and delivers the best. We have worked with several Fortune 1000 companies from a wide range of industry verticals in key markets like USA, the UK, Europe, France, Germany, Israel, Australia and the UAE, helping them with their design, simulation and prototyping requirements. Our highly qualified team comprises of 2D/3D draftsmen, mechanical engineers, and quality specialists who come with years of expertise in drafting and CAD modeling for rapid prototyping with geometry healing, de-featuring, and associated skills. 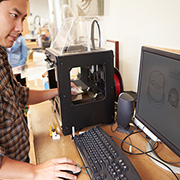 Does 3D Printing Reduce Rapid Prototyping Cost, is a well-researched document that throws light on the facts and assumptions, read it to outsource 3D printing along with rapid prototyping. At Outsource2india, we work as a team and build long-term relationships with our superior quality rapid prototyping services. If you are looking for a partner who has the capability to understand your design ideas, outsourcing prototyping and rapid prototyping services to Outsource2india is the answer. Tell us more about your business and needs and let our experts help you out. Choose Outsource2india as a service partner for your prototyping and rapid prototyping requirements, contact us.